Journalism’s “pink ghetto”: A resident speaks out. How Did I, a Woman, End Up in Women’s Media? 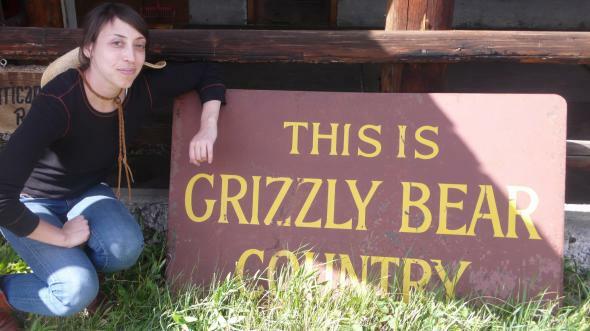 Jessica Grose, lady blogger, grizzly bear enthusiast. Feministing highlights a chart about who writes what in newspapers and magazines, which uses data from the Op-Ed Project. Its results are not especially surprising, even if they are dismaying: Female journalists continue to dominate coverage of family and gender issues, and men continue to dominate coverage of everything else (save “style,” which has a 50/50 gender byline split). Like many fields, journalism suffers from a combination of long-term structural issues and a lack of female applicants. Since I’m one of the data points—a woman who writes primarily about gender and family issues in the so-called “pink ghetto” of women’s publications or women’s sections of general interest publications—perhaps the story of how I ended up here is instructive. I did not set out to write about women’s issues, though I always liked reading about them. When I graduated from college in 2004, I wanted to be a music journalist. My first job out of undergrad was at Spin. The bottom was already falling out of the music mag industry by then; there were layoffs there a month after I left, other music magazines have subsequently gone down the tubes, and at this point Spin no longer publishes a print version. Then, I worked at the general interest magazine Radar. Also: RIP. That’s when I got a job at Jezebel, which raised my visibility and also branded me as a person who writes about women’s issues. After that, the vast, vast majority of the jobs, both freelance and full time, that I was seriously considered for have been “pink ghetto” jobs, including my old job at Slate (and my current Slate freelance gig). By 2011, I started getting mildly resentful. I was so happy to even be employed in a tough journalism market, but I also wanted to show the world that I could do more than cover abortion and Sarah Palin. So I wrote a longform piece about grizzly bears and tried to branch out into more general culture editing and writing. I took a job as a culture editor, which I ended up leaving for lady-part related reasons. As a result of a difficult pregnancy, I went freelance. When I did so, I asked a friend who used to be an editor at Outside about how to pitch them. I had loved reporting about bears, and I thought I could do more animal coverage. He was encouraging and offered to review my ideas, but he also wrote, “Outside is a tough mag to break into, for some reason. Harder than it seems like it should be,” and because I was way pregnant then, and would have trouble traveling to report, I never followed up. I figured I wouldn’t succeed anyway. Once my kid was born, I focused on making money and went where the paychecks are: in general, back to the “pink ghetto.” It’s where my contacts are, it’s what I’m known for, and it’s where I have the greatest depth of knowledge. I often chide myself for falling back on family and gender. I should be pitching more ambitious longform projects! I should be trying to become an expert on wearable technology or Craigslist killers! But the truth is that I don’t have the time or energy to do that, and I don’t want to waste my part-time child care pitching things that might not pan out and pay me. Shani O. Hilton, the deputy editor in chief of BuzzFeed, had a good piece in Medium last week about how difficult it is to build a diverse newsroom. She calls on editors and hiring managers to look outside their immediate networks and for women and journalists of color to actively network with the (mostly) white dudes who are doing the hiring. So what’s to be done to get more women into the fields of journalism where they are least represented, like social action, foreign policy, and national security? Editors should listen to Hilton, but also, young female journalists, if you’re planning to eventually have children, listen to Hilton now, while you’re young and relatively unencumbered. It gets harder to take career risks, financial and otherwise, once you have a kid. I don’t regret my individual choices and am generally happy where I am. But I do occasionally read pieces of swashbuckling adventure journalism that I wish I had written—and know that I could have. Maybe I’ll get back on the bear beat when my children are no longer cubs.